This defect is peculiar to certain blue, maroon and black pigments. It is formed by a loosely adhering pigment layer in the surface which is slightly different in colour from the original paint, and which imparts a metallic sheen to the surface. 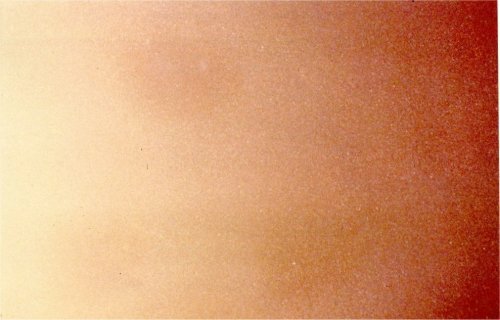 a) Certain pigments will show slight bronzing in any paint vehicle, and the painter has no control over this condition. b) Recommended mixing formula not followed. Certain pigments will show bad bronzing if an upper limit is exceeded in the paint. c) Hot spraying of some reds or maroons. a) Follow the recommended mixing formula. b) Some reds or maroons may have to be sprayed cold. a) Light hand polishing with a mild liquid polish will remove the bronze. Frequent washing and an occasional polish will maintain good appearance. b) In severe cases, wet flat the colour then respray.